Economic map. 400 x 400. Gowen Hold, a small province with three districts... Gowen's Ridge is one of the three districts located off a coast... an area heretofore left alone... this nondescript region has now become the center piece in a powerful game that stretches to the very crown itself! a great eco-map...my review will follow! Gowens Ridge is a classic “place-your-keep” scenario. The author gives you a very free hand to build up and to develop your colony right from the scratch. A good deal of imagination and tactical skill is required to manage this seemingly unspectacular map. I personally experienced lots of fun and challenge, though I don’t believe that it would be playable successfully on “very hard”. Even on “normal” you’ll have a hard time to achieve all demanded goals with regard to the time limit breathing down your neck. The earlier you’ll get the southern iron deposits and these sleeping and lurking wolves under control, the better will be your chance to be victorious at the end. That’s quite possible to restart several times until you will find out both an effective building sequence and a suitable method to get rid of these annoying wolves. You have to deal with a fine eco-map rich of substance representing a well-tuned concept that really “bites”. In my opinion, map design is the weakest part of a superb map. It’s a solid work, but some areas look unnatural or clumsy like the northern plateaus and other elevations. The stone deposits have also an artificial effect on me. 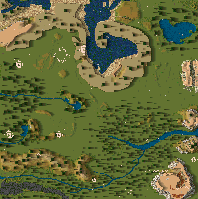 Besides, with regard to the objectives you are forced to colonize the eastern half of the map, while the western wild regions don’t play any part in this scenario and remain nearly “untouched”. There aren’t any special features or characteristic highlights on this map apart from a small landing stage located at the northern coast. The author “dgenese” created an entertaining and vivid story, written up imaginatively and impressing by its easy and fresh style. Because of that you never can stop reading on – simply excellent! Don’t miss this fine and challenging map, it’s worth a try (or two)! Cool map. The creator doesn't force you to handle it the way he wants it to be played (it's highly annoying when map creators do that) and it's a very challenging map, without having the sense you're up against a flood of disasters. This map is broken. no reason to have 3 armories and a few bakeries get taken out when the Bandits can't get anywhere near them. They busted the stairs to get out of the gully but still take down buildings on the other side of the map. Because they arent really there my Achers don't shoot at them. another senceless creation is haveing all 4 problems at 1 time ie Thief of grainery, wolves, bandits, and plagues. not once but twice. when the wolves and plagues alone drop the popularity 20 points each, then a total of 20 points a month for as long as they stick around. put lvl 5 unplesent on top of that to try and get the product in. Map is a waste of time. It's to bad it looked like he put some thought into the map he just got to sedistic. I can't agree whith the previous comment , map is doable at every level . Following the spot where the keep was set , bandits are more or less inefficients. The feature whith vanishing buildings is random , seems the effect of trees growing in the tiles near the signpost of invasion .